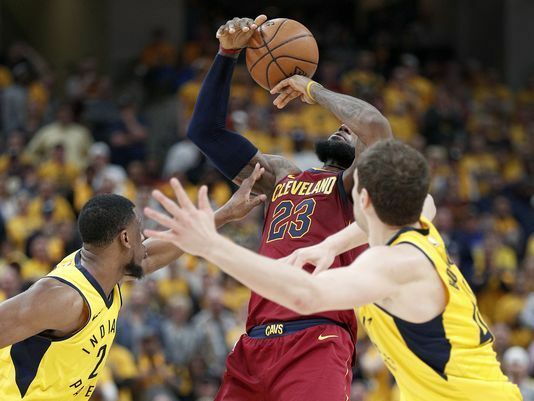 The Indiana Pacers defeated LeBron James and Cleveland Cavaliers 92-90 on Friday night to win Game 3. The Pacers erased a 17 point halftime deficient to come back and win Game 3. They were down 57-40 at half then ultimately held the Cavs to 33 points in the second half. This was a inspirational win for a Pacers team and will have all the momentum heading into Game 4. The Pacers who have been led all year by their first year All-Star Victor Oladipo who scored 18 points and had 7 assist was overshadowed in this one by the game played by Bojan Bogdanovic. Bogdanovic showed out in front a Pacers crowd who was rowdy all night scoring a game high 30 points 7-9 from three. He guarded LeBron for most of the game, while scoring 15 of his 30 in the fourth quarter. His play was the difference in the game and kept the Pacers within striking distance and they ultimately made their come back. Thaddeus Young contributed with 12 points and 7 rebounds. Lebron James who had scored 46 points in Game 2 showed up once again with 28 points, 12 rebounds, and 8 assist while playing the entire second half. Once again he didn’t get much help from the others. Kevin Love had his usual contribution with 19 points but no one else played well. George Hill scored 13 points and starting shooting guard Kyle Korver who played 20 minutes did not score. James has not got consistent help all series from his teammates. Now being down 2-1 heading into a Game 4 on Sunday the others must show up with energy, effort, pace, etc. or the LeBron and his Cavs will be heading back to the Quicken Loans Arena facing elimination. Period. Next Game: Sunday 4/22 5:30 PT. What To Watch For: Will LeBron get help from someone who wants to step up?